Perhaps the strangest thing in modern discourse is that anytime something bad in our country's history is mentioned, the left paints it as uniquely American. Yet, anytime there is a remarkable and heroic event, the left ascertains it was an achievement accomplished by all of humanity. This was evidenced yet again by Hollywood’s portrayal of Neil Armstrong landing on the moon in 1969 as a "human achievement" and deciding to omit the iconic scene of Neil Armstrong planting the American flag in outer space in an upcoming movie, First Man. As Cortney covered yesterday Ryan Gosling, the Canadian actor who portrays Armstrong in the film, told the media, "I think this was widely regarded in the end as a human achievement [and] that's how we chose to view it. I also think Neil was extremely humble, as were many of these astronauts, and time and time again he deferred the focus from himself to the 400,000 people who made the mission possible." "He was reminding everyone that he was just the tip of the iceberg - and that's not just to be humble, that's also true," Gosling continued defending the decision. "So I don't think that Neil viewed himself as an American hero. From my interviews with his family and people that knew him, it was quite the opposite. And we wanted the film to reflect Neil." Well according to American hero Chuck Yeager (keyword being American, Ryan), that depiction of Armstrong could not be further from the truth. Responding to multiple tweets, Yeager said that this movie was "Hollywood make-believe" and "that's not the Neil Armstrong I knew." Obviously, it does not take Chuck Yeager saying Armstrong was indeed an American hero to indicate that the first man on the moon was the direct result of American ingenuity, but thankfully he did. However, this whole ordeal speaks far to more to the insanity of the left than anything else. For whatever reason, liberals believe that America, for all intent and purposes, introduced original sin into the world. The left's revisionism of American history, therefore, is no surprise. The fact that they are now distorting an American hero is not all that bizarre either. But, it seems different this time. Typically, when Hollywood and liberals discuss American history in movies, literature, and television it is presented as a past filled with racist bigots who slaughtered Indians, enslaved millions, and caused virtually every problem seen throughout the world. It seems more often than not the left actually does believe that slavery originated in America, that racism solely occurs in America, and that America is the only nation to ever engage in war and other atrocities. So finally, the left produces a positive movie about an American hero and what do they do? They strip away arguably the most integral part of Armstrong -- his American identity. Wouldn't this be considered cultural appropriation in any other situation? Aren't Disney movies criticized for taking characters such as Mulan and making her too generic and not quite Chinese enough? Aren't Cinco de Mayo celebrations on college campuses lambasted as hate-filled slugfests because 20-year-old white chicks don a sombrero and drink a Corona? The answer is yes, they are because the left believes that those situations are stealing different cultures' heritages. So, then how is a Canadian playing an American hero who accomplished something based on the boldness and creativeness of American public servants, scientists, and paid for by taxpayer dollars but saying his achievements were a humanitarian effort and not that of the United States anything but cultural appropriation? Humor me for a moment. Let's give Ryan Gosling the benefit of the doubt. Perhaps he meant that in the American ideal of "E Pluribus Unum" (out of many one, for those who never learned this mantra) anybody from around the world could come to America and adopt our ideals and someday accomplish something like Armstrong. After all, as Ronald Reagan said, "America represents something universal in the human spirit. I received a letter not long ago from a man who said, 'You can go to Japan to live, but you cannot become Japanese. You can go to France to live and not become a Frenchman. You can go to live in Germany or Turkey, and you won't become a German or a Turk.' But then he added, 'Anybody from any corner of the world can come to America to live and become an American.'" If Gosling was actually saying this, his comments would make a lot of sense. No other country in the world has dedicated as much of itself to helping its fellow man, sacrificing, nor promoting freedom as America has. 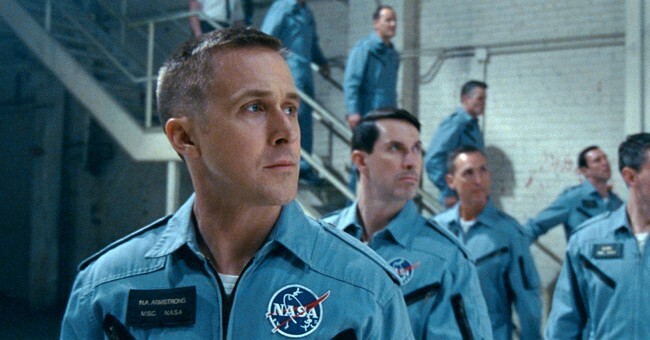 Indeed, if Gosling were to view Armstrong as an American hero he would understand the moon landing was "an achievement" for all of mankind but not because of all mankind. It was an achievement because as President John F. Kennedy noted, more than any other country, Americans choose to do daring tasks not because they are easy, but because they are hard. In the bold tradition of American pioneers, our nation's heroes daring pursuits have benefited mankind far more than any other nation on Earth. Our accomplishments of said tasks push mankind to better heights. It is that boldness which makes America exceptional. But, the left refuses to highlight that in entertainment. Liberals believe America is unique only in its downfalls. Our exceptionalism lies within our faults, not within our triumphs according to the left. This thinking will ultimately do more damage in the long run for mankind than whatever fears liberals have about embracing true American exceptionalism. Yet, for a conservative, recognizing and honoring true American heroes like Armstrong as the embodiment of this exceptionalism rightly portrays our nation as a shining city on a hill for all of mankind to look to for guidance.